Shared kitchen / dining room. 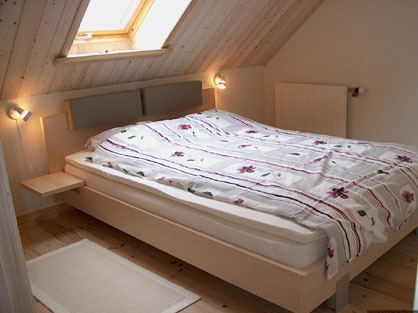 Room 1: Small double room with nice double bed. All prices are incl. bed linen , towels and all you need for the kitchen. In 2015 I will not be able to serve breakfast. But exceptions can be made if you are hiking og cykling tourist. If you want to make your own breakfast coffee / tea is included in the price and there is a fully equipped kitchen .When you book , please inform about the approximate time of your arrival . The Bed and Breakfast is someting I do in leisure time for pleasure ! I have a high quality place , but you should not expect hotel standards. The failites are open form ca. 1 of april - middle of october. Big double room with double bed. Room nr. 2 : Double room with twin beds. Views to the cliffs and sea. Can also be rented as a single room. Room nr. 5: Double sofa - can be made to double bed ( NB. Only 1,9 m. long ) + old farmhouse bed , sleeps one child . Out of season this room is used as an extra sitting room . 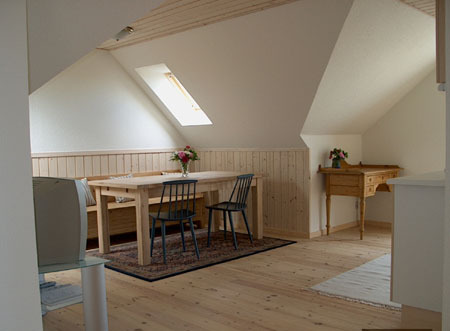 It may in the high season be rented as a familiy room together with adjorning room 4 , sleeps 2 adults and 2- 3 children. Ask for a price as family offer. Room 5 made as a double bed ( 1,9 m long ) . In this room there is an oldfarmhouse bed , suitable for a child . It is close to room 4 , a small single room . Wireless internet is awailable in this room. I can give you off the price for longer stays or if you bring your own bed linen.